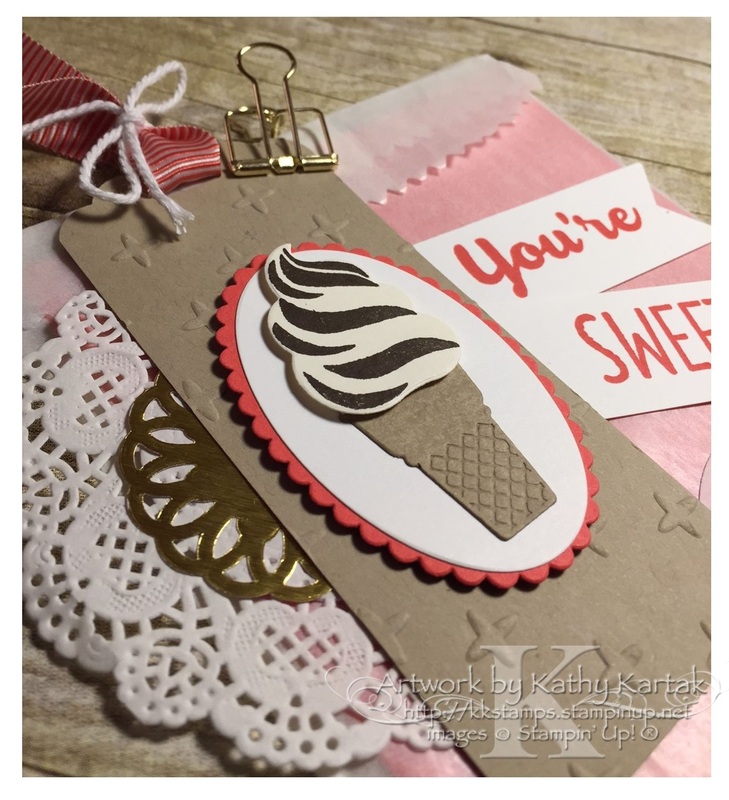 #stampinup #faithfulinkspirations Over the past few days I've been sharing projects that I made as a display stamper for Stampin' Up's OnStage event in November. We were asked to make cards, scrapbook pages, and 3D items. Today's treat bag is the first of my 3D items. (I'll be sharing another one next week.) It also uses the "Cool Treats" stamp set and Frozen Treats framelits (the bundle will save you 10%, item 145181) and Tasty Treats Card Stock Pack (item 142771)--along with some other embellishments. Here's how to make the tag for the treat bag. I started with a 2" by 4" piece of Crumb Cake card stock. I embossed it with the Sparkle Embossing Folder. Then I punched the top with the Scalloped Tag Topper Punch and rounded the opposite end with the Project Life Corner Punch. I slipped a length of Watermelon Wonder 5/8" Inch Mini Striped Ribbon through the opening and then tied a Thick Whisper White Baker's Twine Bow around it. Next, I cut a Watermelon Wonder scalloped oval and a Whisper White oval from the Layering Ovals Framelits. I adhered these to to the tag with Stampin' Dimensionals. I cut a Crumb Cake cone and a Very Vanilla ice cream using the Frozen Treats Framelits. I stamped an Early Espresso swirl from the "Cool Treats" stamp set onto the vanilla ice cream. 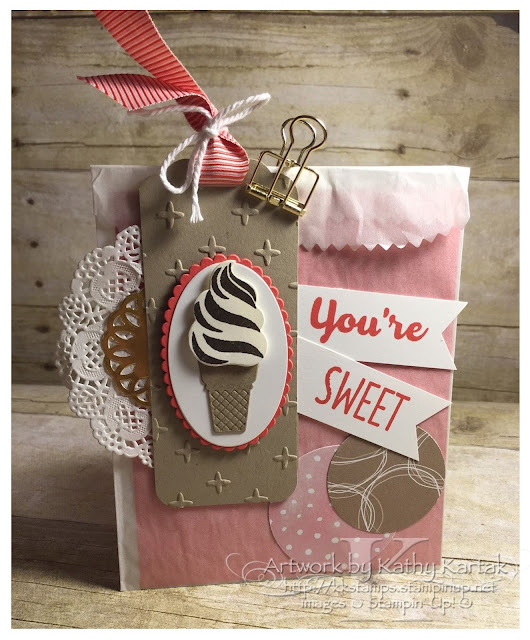 I adhered the cone directly to the oval piece and used Stampin' Dimensionals to adhere the ice cream piece to the oval. I adhered half a Gold Metallic Foil Doily and half a Delicate White Doily to the back of the tag. Then I cut two 1" strips of Whisper White Card Stock and flagged the ends with the Banner Triple Punch. I stamped the sentiment in Watermelon Wonder and adhered these to the back of the tag as well. I used the 1-3/8" Circle Punch to cut a circle from a sheet of Serene Scenery Designer Series Paper and the 2" Circle Punch to cut a circle from a sheet of Fruit Stand DSP. I adhered these to a Glassine Gift Bag. I inserted a 4-1/2" x 5-1/2" piece of Watermelon Wonder Card Stock into the gift bag for stability and folded down the top of the bag. I attached the tag to the bag using a Gold Binder Clip. This design is a bit out of my wheelhouse, but I think it turned out very well (if I do say so myself, and I do)!